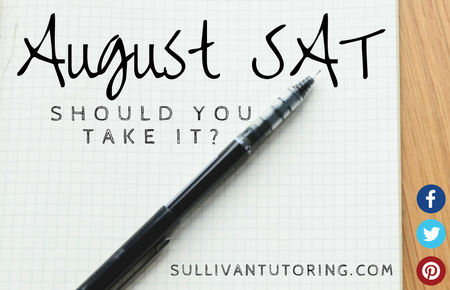 August SAT: Should you take it? Are you going to be working at your summer job a ton? Are you going on a bunch of vacations in July and August? Do you have constant commitments to sports and sports camps? The key is to prepare for and take the SAT when your brain isn’t too stressed. If you can dedicate time to SAT prep and tutoring during the summer, then taking the August SAT might be a good idea. If you simply cannot devote any attention to studying, it might be a better idea to wait for a later test date. As a junior, you have more options in terms of when you can and should take the SAT. If an August test date doesn’t fit into your schedule or you’re simply too busy during the summer, don’t worry. You can take the SAT in the fall or spring at times that are most convenient for you. If you’re a senior, this part gets a bit trickier. If you’ve taken the test already, but you want to take it once more before the chaos of the college application process ensues, the August test is a good option. Again, just make sure you prioritize test prep if this is the case. Additionally, students that are applying early action/decision to colleges may want to utilize the August test date as a way to get ahead on their to-do list since the college application process begins sooner with EA/ED. If the August test is just simply out-of-the-question, the October SAT is still fine for both ED and EA, but you should still double-check with the specific colleges. If you haven’t started test prep at all yet, it might be a good idea to wait for the October test. If you do decide to take the August SAT, however, now is the time to really buckle down and continue digging into those practice tests. Even if you’re taking a fall test instead, preparing during the summer is crucial to keep your brain sharp and ready for those fast approaching test dates. Still not sure whether or not you should sign up for the August SAT? The team at Sullivan Tutoring can help you make your decision. Contact us here. What are the three things an adverb can describe? Want to receive our newsletter, Sullivan Scoop, and gain access to original articles, testing tips, industry news and important dates? Text SULLIVAN to 42828 to join our mailing list.